It may not be immediately apparent, but the “Forever Young” track list is intended to reflect the arch of the day. From from “Rainbow Connection” through “Moon River,” the lyrics, instrumentation, and production start bigger and brighter, then transition to more somber and sleepy. “Mr. Tambourine Man,” then, is all about the transition to night. 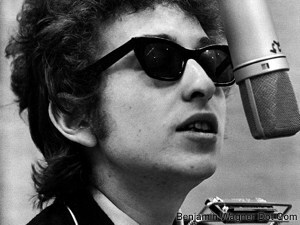 True, “Mister Tambourine Man” isn’t a kid’s song (Dylan apparently wrote the song after a trip to Mardi Gras), still, the dream-like imagery (which some describe as “surrealistic,” and attribute to the influenced of French poet Arthur Rimbaud and Italian filmmaker Federico Fellini) seemed perfect for this record. Through the “smoke rings of [Dylan’s] mind” to the “foggy ruins of time” “surrounded circus sands,” the song is rich with other-worldly imagery. While some have attributed the surrealist imagery to Dylan’s burgeoning drug use, many have read this lyrical willingness to follow his musical muse as a “search for transcendence” (see also: “Rainbow Connection”) — a pursuit I can only wish for my daughter. Better, perhaps, than dream imagery and search for transcendence, is the song’s rich life lesson. In recording “Forever Young” for Maggie, I’d hoped to give her a series on small, inspiring gifts. To that end, “To dance beneath the diamond sky with one hand waving free” seems to me to be a pretty good way to live. Chris, Tony Maceli, Ryan Vaughn and I recorded basic tracks in March with Gary Atturio at Galuminum Foil Studios. I tracked additional guitars, vocals, and (of course) tambourine in my Hell’s Kitchen Studio (aka walk-in closet), well prior to moving to the Upper East Side. Bryan Dunn (whose rootsy, authentic body of work and and reedy, rockin’ voice, seemed an ideal fit for the cover) and I bagged vocals (and his guitar solo, natch) in Maggie’s nursery just a few weeks before she was born. Producer Jon Locker added Dylan’s signature Hammond Organ (complete with whirling Leslie speaker) in Des Moines shortly thereafter. Download “Forever Young” on iTunes, or purchase a physical copy from Authentic Records Online now!